On Saturday 10 June we are holding our summer social. 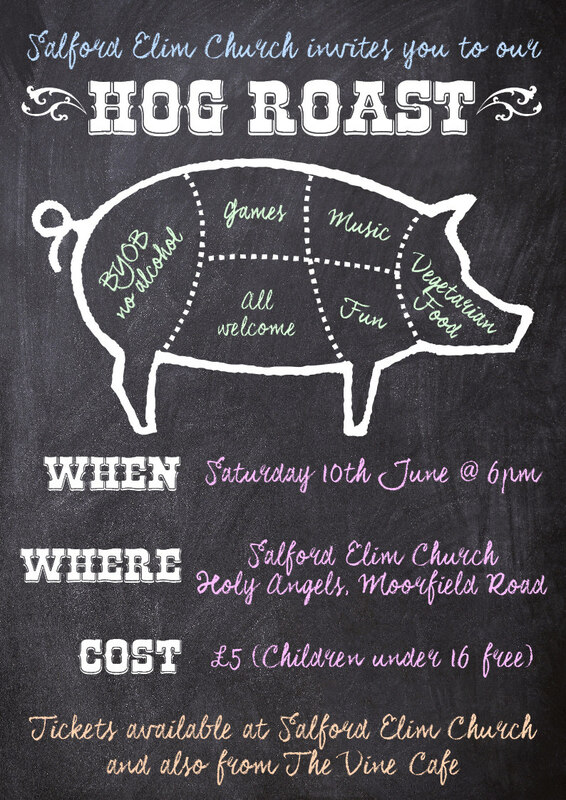 It’s a hog roast (that takes vegetarians into account) that will be accompanied by music, garden games, and best of all a chance to chill with each other. It’s an alcohol-free event, and the evening kicks off at 6pm. More details here. On Sunday 11 June, we have a baptism as part of the morning service. Baptism is the moment when we declare to everyone what has happened to us. We show that we have died with Christ and have been raised to life with him. It’s such a foundational event. If you want to take this step of commitment, then talk to Natalie as soon as possible. Every term we have a run of evenings that give us a chance to take a deeper look at some specific issues. We begin again on 22 June, 29 June, 6 July. Last month I asked what would be most helpful – and what came top in the poll was ‘How to answer tough questions about the faith’. So now Neil needs to know – what are those tough questions? Whether Christianity is the only truth? What would you say would be helpful to explore together? We had a great turn out for the sessions in April which focused on wellbeing. We were so pleased to see so many women sharing and encouraging one another, listening and learning together. Thank you for the positive feedback, we’d like to pick this theme up again in the future. Our next 2 sessions will be on Wednesday 21st and 28th June. Our sessions will look at Faith & Creativity and focus on ‘Abiding in the Vine’. We will reflect on John 15: 1-8, and think about what it means to be and stay connected to Christ. There will be space to listen and learn, pause and pray, discuss and express, reflect and create. You don’t have to be an artist or see yourself as creative in order to attend, most of us don’t see ourselves in that way. There will be different options available for you to reflect and respond and there will be something for everybody. What matters the most is that you come if you can make it. We grow together when we come together and God always reveals something. It’s helpful to know who, and how many plan to come so that we can provide enough resources, so please let Natalie or Susie know if you can make it. The monthly book group meet sat The Vine at 8pm on Wed 14 June. This month we are discussing ‘Beloved Dust’ by Jamin Goggin and Kyle Strobel. We were formed from the dust, but we were made for life with God. We often accept less. We make promises and set goals to try and grow, but holiness seems impossible. But the Christian life is not about looking or feeling like a Christian. It’s about abiding in God. If communion with God is your goal, self-help strategies and personal resolutions will fail you. But Jesus Christ will not. Drawing deeply from Scripture and narrating their own experiences, Pastor Jamin Goggin and theology professor Kyle Strobel wrote this book to be a companion for your journey with Jesus in the truth of yourself – as his beloved dust. This is not weighing tasks and rewards, but is a process of patience, prayer, and openheartedness. Rob is planning a daytime Alpha course – if you or anyone you know would benefit from attending this, then please talk to him for more details. Deep down we know that this Christian life only makes sense when fuelled by prayer. But it is so easy to assume that we can get by without going deep in prayer. If you want to pray alongside others, you can join the group led by Corinne on Friday mornings, or meet with a few of us before Sunday morning services from 9.30 onwards, or with Rosie every other Thursday evening. We have a WhatsApp group for people who do want to pray for others in details. And if you can access our closed church Facebook group Beyond Sunday, you can pray for the requests that are often put up there. And if you want to start other groups – chat to us about it. Following on from the first jam session, we are having another on Saturday the 17th of June between 2.30 and 5pm. It’s an opportunity for those who are not currently involved in the church worship band to build confidence and make some noise! You don’t have to be an amazing musician but you do need to be able to sing a bit and/or play in time with others. If you are thinking of coming or want more information, see Ian. 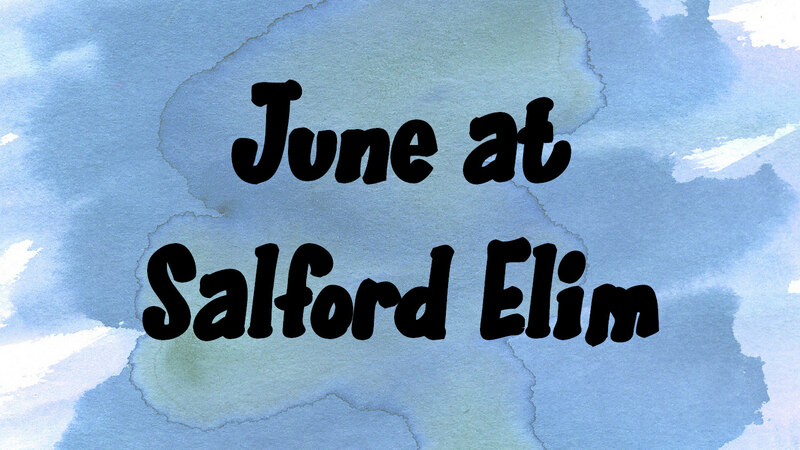 Throughout June, we are praying for Elmwood church and will be sending Corrine to encourage them. If you would like to join Corrine or would like more information about this initiative, see Ian. For wisdom for our Trustees and Leadership team as they begin the process of appointing a new Pastor. For Matt Pierce that he will continue the development of our work with children and young people particularly for those with a non-church background; that he uses his time wisely and efficiently. That they will seek earnestly to put their Vision into Action. On Saturday 10 June there is a united walk of witness with people from all the Christian tradition between Salford Cathedral and Manchester Cathedral. They will be Gathering at Salford Cathedral at 10am, taking part in an open air worship service in St Ann’s Square at 11.15am, culminating in a United Celebration at Manchester cathedral at 12pm.